It’s Women’s History month. A special time when well-known and a few no-so-well-known women get highlighted. 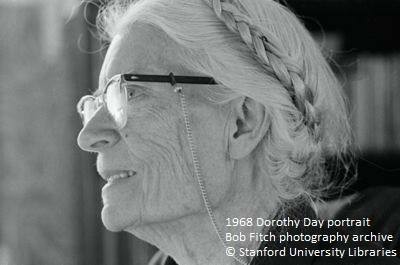 Even thou gh she was publicly acknowledged by Pope Francis as a great American during his 2015 speech before Congress, too many have heard too little about Dorothy Day. She was the co-founder of a movement that has produced Catholic Worker communities, “committed to nonviolence, voluntary poverty, prayer, and hospitality for the homeless, exiled, hungry, and forsaken.” The organ of the movement since its inception in 1933 is The Catholic Worker newspaper. As their Website goes on to say, “Catholic Workers continue to protest injustice, war, racism, and violence of all forms” (www.catholicworker.org). What’s exciting is that an open digital archive of The Catholic Worker (1943 – 2016) has just become available, with promise of the first decade being added soon. Nonetheless, these digitized primary sources at thecatholicnewsarchive.org already give a unique and invaluable view on current world events from World War II to the early twenty-first century. The media this week is buzzing about Pope Francis’ announcement to open the 1939-1958 files in the Vatican archives. As much as it will be a boon for scholars to be able to investigate those World War II/Holocaust-era documents, they won’t become available until March of 2020. Until then, and even on into the future, it’s great that researchers will have ready online access to some notable and freely-available historical primary sources via The Catholic News Archive, a project of the Catholic Research Resources Alliance (www.catholicresearch.org). Special collections and archives existed long before we had computers. How did people find out about them in those dark decades of the twentieth century? Repositories often sent descriptions to the National Union Catalog of Manuscript Collections, managed by the Library of Congress. These collection-level descriptions appeared in bound volumes and on cards for the catalog. 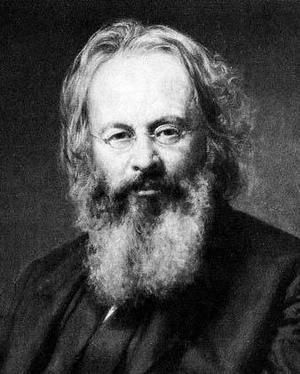 In the 1960s, if you had an interest in one of the writers associated with the New England Transcendentalists, specifically Orestes A. Brownson who later became a Catholic, you could check the NUCMC and find that Notre Dame has his papers and published a microfilm edition of them. If you were flipping through Notre Dame's card catalog looking for books by Brownson, you would discover that we also have his papers. A link to the new flier, A Fully-searchable open digital repository of historical Catholic news, is on the home page of the Catholic Newspapers Program. Scroll down to find the link to this downloadable, printable flier. This flier was distributed to attendees at the American Catholic Historical Association 2019 Annual Meeting in Chicago. Following a brief description, the focus is on what scholars, librarians and archivists say about their interests and use of Catholic newspapers. 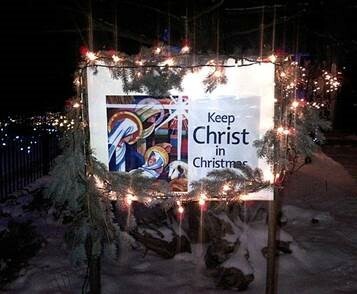 When Did American Catholics Start Asking to Keep Christ in Christmas? While the concept to keep Christ in Christmas is not an exclusively Catholic theme it was interesting to discover by using the Catholic News Archive when the slogan started being promoted in earnest by Catholics in the United States. It seems it became a rallying cry after the Second World War. The National Catholic Welfare Conference News Service was the source that was later to become known as Catholic News Service Newsfeeds. They record in December 1949 an editorial entitled “Unholy Fraud” had caught widespread attention. As a former beginner myself, I recognize that the desire to produce EAD finding aids does not immediately result in their production. Among the members of CRRA, the more prosperous institutions can support compute r systems that automatically generate EAD. But even these systems require an understanding of archival theory and how it might be maintained in a way congenial to machines. And other members of CRRA have the more difficult task of producing EAD without sophisticated equipment and IT support. CRRA developed the EAD Template to help those who have no easy way to produce valid finding aids. While it tries to make EAD as easy as possible, beginners may still have bad luck with it. When I attended the Rare Book School EAD course at the University of Virginia in 1999, I had already produced hundreds of EAD finding aids. Daniel Pitti, the teacher of the course, offered helpful criticism and mentioned several mistaken ways of thinking that he had found among beginners. When CRRA members started using the EAD Template, I found one of these typical mistakes cropping up. Archivists preserve filing systems that grow organically as routine activities generate records. The context of a document has evidential value; the whole filing system provides evidence about how an organization or individual conducted business, and therefore evidence of values, crises, attacks, defense mechanisms, unexpected events, daily life. Descriptions of such filing systems need to represent the organic form faithfully in all of its meaningful structure and peculiar quirkiness. Since filing systems generally have a hierarchical form, finding aids must also allow for components that contain other components that may contain other components -- boxes within boxes within boxes, or files within files within files. Thanks to our familiarity with common filing systems on computers, we should have no trouble with this concept. Typically graphical displays of the contents of a hard drive show pictures of folders, and inside them other folders, and after a number of these eventually the individual computer files. One can generally also choose to view the same structure as an outline representing this structure in a slightly different way. Max Tolomei and I cordially invite you to attend a sneak preview of the updated and soon-to-be-releasted CRRA website. Max and I have been working to move the CRRA website’s content into the open source content management system, Concrete5, and re-evaluating the organization and function of the website as a whole. Using Concrete5 will bring our site into the 21st century, making it possible to dynamically update content, and allowing members to easily collaborate and share project information in a variety of ways. Before taking the site "live," we seek your input into how the site works for you and how it might be improved. At our March 30 All-members meeting in Philadelphia http://bit.ly/CRRA_SJU , we will take a look at where we've been and where we are going. The strategic draft plan: Goals for 2011/2012 will guide our discussion. You can have a sneak preview here: http://bit.ly/DraftPlan2012. Are you interested in learning more about Catholic digital scholarship and innovations in text mining and visualization to facilitate knowledge discovery within the Catholic portal? Please join us virtually or in person this Thursday, Feb. 24 from 1:00 to 5:00 pm EST (noon Central, 10am Pacific). For event details, see http://bit.ly/hWMU5j. I have created a set of really simple movies demonstrating the features and functions of the "Catholic Portal" -- http://bit.ly/eCls8b Enjoy!? Web 2.0 - All the Web 2.0 links (cite this, email this, favorite this) that did not work previously now function correctly. EAD viewer - It is now possible to view EAD files locally or from the originating institution. Item-level indexing - The content of EAD files is indexed at the item level making for finer-grained searching. Text mining - After extracting the full text from the PDF documents, it is possible to apply concordancing techniques to the full text for analysis. Automated updating - The "Portal" can be updated automatically by harvesting metadata from member institutions, massaging it for the Portal, and re-indexing it on a regular basis. Use statistics - Rudimentary Web server log file analysis as well as Google Analytics reports illustrate how the Portal is being used. Blog - A running commentary on what's happening with Portal development.